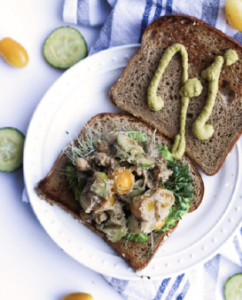 This cold chickpea and cucumber sandwich is perfect for those busy weekday lunches! It’s quick, delicious, and healthy. Dice up the cucumber and cherry tomatoes. Toss in a large bowl with chickpeas. Pour in the tahini and balsamic vinegar. 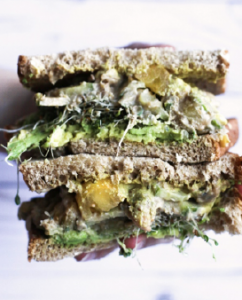 Once mixed well, assemble your sandwiches by adding the sprouts, avocado, mustard, and anything else you’d like!